It was a professionally produced b&w slick cover fanzine.44 pages for $1.50. 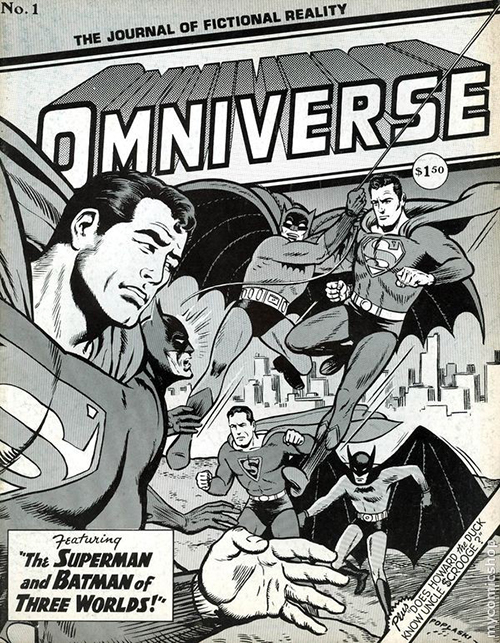 Interestingly the associate editor was Dean Mullaney would would soon found Eclipse Comics.Also on staff was Mike Gold who later became editor of First Comics.Jerry Ordway did interior art,Pete Poplaski did the first issue cover.I'll deal with the cover subject first,The Superman and Batman of Three Worlds.It was not like I thought I remembered.The subject was only dealt with in a 1 and 1/2 page segment,part of a bigger article. For me,I could buy much of this theory just because the Jack Shiff Batman is so unique between what came before and after. Next:Does Howard The Duck come from the same universe as Donald and Uncle Scrooge? I always thought that the Super-Friends series and comic could have taken place on Earth-E. I've got the second issue, but haven't seen it in years. I'm reading my Elephantmen run now (highly recommended) and one of the characters is named Gruenwald. My favorite part about fanzines is how you'll find contributions to people who later would go pro. Oh yeah, or letter columns. I have both issues of Omniverse, and think they are great fun. Mark Gruenwald was having a ball figuring out where every story from every comic all fit together and as wacked out as that sort of sounds, it really works on the page. Probably two of the best comic fanzines ever printed, and I should add not hard to find at reasonable prices. Then you have the culture shock of medieval castles living side-by-side with modern times.Sleeping Beauty and characters from the Sword and the Stone showed up in Uncle Scrooge's money bin in a 1977 story.The 2 mice,Gus and Jaq,after Cinerella got married,wound up moving to Grandma Duck's farm. The logical solution lies within the Enchanted Forest (or The Black Forest) a nexus of all realities,a place of powerful magical forces that enable denizens to travel from one Disney reality to another.Thumper has met the Seven Dwarves on several occassions,probably after running thru the forest.Mad Madame Mim showed up in Ducksburg in Beagle Boys #1,as well as in Never Never Land and Alice's Wonderland.The Enchanted Forest can explain all these cross-overs of denizens from different time zones. He's had a lot of cameos over the years. Walt Simonson had him as middle-management for the Time Variance Authority, which was a nice nod to Omniverse. I loved this series and thought it a shame the third issue was never released, even though I rarely cared for Grunewald's ideas when he brought them to Marvel as a pro. I deeply admire what he was trying to do to show the largest tapestry that all of these would exist within, which of course no one else is going to show except for their corner.